Make pieces of paper fly through the air and stick onto a balloon. Inflate the balloon to a size that fits easily in your hand. Tie a knot in the end of the balloon. Use the hole punch to cut several small circles from the sheet of paper. Rub the balloon back and forth gently on your hair about 10 times. Don't press too hard. Your hair should be clean, dry, and oil-free. Hold the balloon close to, but not touching, the paper circles. Watch what happens. Don't forget to take off your hat before you rub the balloon on your hair! Why does the balloon pick up the confetti? Atoms are the teeny tiny particles that make up all matter. Atoms have even teenier pieces, called electrons, that they wear like coats. Sometimes the atom wears all its coats, sometimes it takes off one or more. When you rub the balloon on your hair, some of the electrons rub off and stick to the balloon. The electrons have a negative ( – ) electric charge, so the balloon has a negative charge. When atoms are missing electrons (they've taken off a coat or two), we say they have a positive ( + ) charge. The confetti you made has a few electrons missing, so has a slight positive charge. Negative and positive charges attract each other. So, the confetti sticks to the balloon! 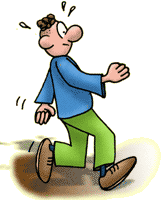 Atoms that have either a negative or positive charge are called ions. The Deep Space 1 spacecraft uses an ion engine to propel itself through space. 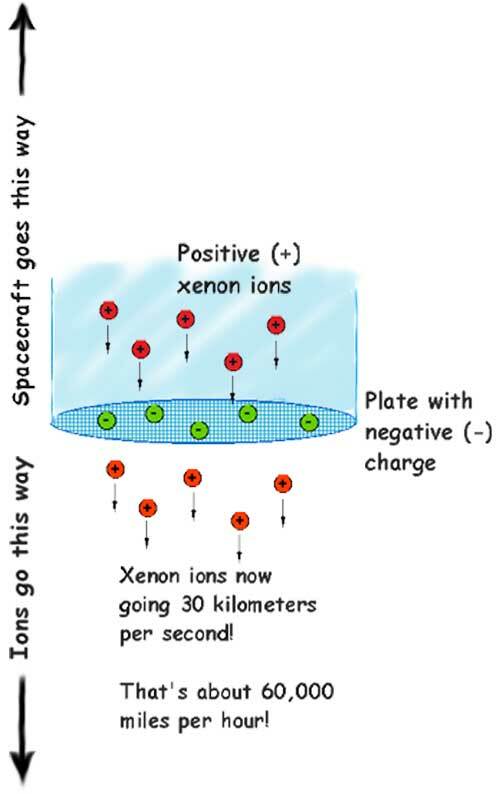 The ion engine contains a gas called xenon (pronounced ZEE-non). The xenon is given a charge, just as the confetti has a charge. Another part of the ion engine is a thin sheet of metal with many little holes in it (sort of like a window screen). This metal screen also has a charge, like the balloon. So the metal screen attracts the xenon ions like the balloon attracts the confetti.The charged metal screen makes the xenon ions move very fast, so they zoom right through the holes and out the other side of the screen. As they shoot out (the action), they push back against the spacecraft (the reaction). The forces of attraction are very strong in ion propulsion. The ions actually move much faster than does the hot gas coming out of a regular rocket engine. So the ion propulsion system works even better! The force of the ion propulsion system that the Deep Space 1 uses is so small, that the push it gives the spacecraft is like the weight of a single piece of notebook paper resting in your hand. The Deep Space 1 spacecraft gets fantastically high "gas mileage," but it accelerates very very gently. To go from 0 to 100 kilometers per hour (about the same as 60 miles per hour) would take Deep Space 1 two and one-half days! How long would it take you to go 1,000,000 kilometers? To walk that far, you would have to walk for 8 hours every day of the week, every week of the year, for your whole life! To drive that far at the top speed allowed on highways in the United States, you would have to drive 24 hours a day (without stopping for gas, food, going to the bathroom, or stretching your legs), every day for a year-- and then you would still have to drive for another month! To fly that far in a jet, you would have to fly for 6 weeks without stopping! So what's an ion engine really good for? 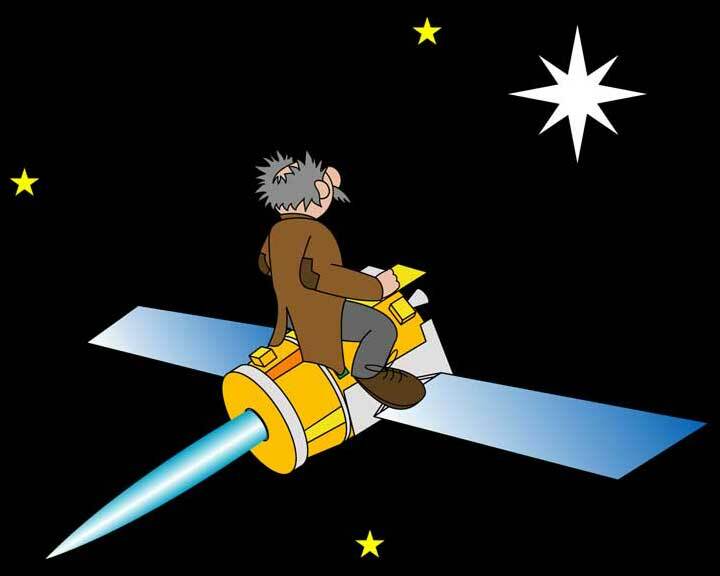 Read the story of Professor Starr's Dream Trip, made possible by the ion engine.